In this remarkable book lies the secret to creating affluence. Here you will discover that you are the dancer and the dance, the creator and the creation, and unlimited wealth is yours merely for the asking. 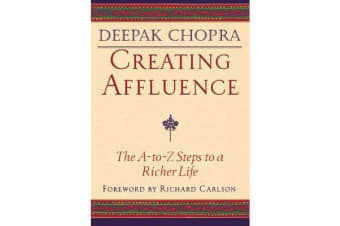 With clear and simple wisdom, Deepak Chopra explores the full meaning of wealth consciousness and presents a step-by-step plan for creating affluence and fulfilment on all levels of our lives. According to the author, affluence is our natural state, and the entire physical universe with all its abundance is the offspring of an unbounded, limitless field of all possibilities. Through a series of simple steps and everyday actions, “Creating Affluence” gently fosters the wealth consciousness needed to tap into this field and create anything you desire.